EU integration, the process of EU enlargement and further visa liberalisation have encouraged increased population movements across Europe, some of which have taken new forms compared to previous migration waves. In particular, some destination countries have experienced high levels of temporary migration from poorer parts of Europe. Using a new set of survey data, we seek to obtain a deeper understanding of the factors affecting migration decisions by comparing migrants from three different sending countries in three destination countries under different migration regimes: Poles in the UK, Romanians in Italy and Serbs in Austria. The surveys were conducted in 2011 and 2012 and cover migrants who migrated between 2004 and 2012, which for Polish migrants in the UK corresponds to a phase with free mobility and full access to the labour market; for Romanian migrants in Italy it coincides first with visa liberalisation and then with full access to the labour market starting with Romania’s EU accession in 2007; lastly, for Serbian migrants in Austria this includes a visa liberalisation regime from 2010 onwards. The surveys undertaken in the different (host) countries were using an almost identical methodology, thereby allowing for a direct comparison of the factors underlying the decision to migrate. 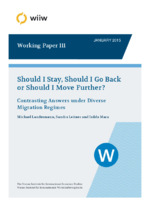 Thus, migration preferences with regard to permanent, return and out-migration under different migration regimes, restrictive versus free mobility, could be analysed. At individual country level results show the weaker preference for permanent migration amongst the highest skilled which points to a lower attachment to a particular destination country. Furthermore, a change in the migration regime towards freer mobility contributes to the intensification of temporary and outward mobility among the highly skilled.